The great Albanian writer Ismail Kadare acquired a national reputation for literary work at a very young age, and he was selected for the Gorky Institute of World Literature in Moscow at the age of twenty. ‘Twilight of the Eastern Gods’ is the lightly fictionalized account of Kadare’s time at the Gorky Institute. This was a great honor for a college age guy from the small country of Albania, and Kadare had a wonderful time in Moscow playing ping pong, chasing a number of Soviet girls, and walking along the river searching for places with a band and music. However as for producing literature, Kadare quickly found the Gorky Institute a non-starter. The Soviet Union was still recovering from the Joseph Stalin tyranny, and it was dangerous to be an independent creative writer there. Of course Russia has a proud tradition of producing great writers, and the Soviet Union wanted to continue that tradition even under the severe constraints of the post-Stalin era. In the Soviet Union the style of literature called ‘Socialist Realism’ was in heavy fashion, and Kadare has a great time making fun of it. The main purpose of Socialist Realism was to advance the goals of socialism and Communism and usually involved proud peasants working in the fields in order to achieve these goals. What annoyed Kadare most was that none of the writing being produced there contained any real description of how things actually were in Moscow. The defining event of the time that Kadare spent at the Gorky Institute was when Russian writer Boris Pasternak was awarded the Nobel Prize for Literature in 1958. Pasternak’s novel ‘Dr. Zhivago’ was rejected for publication in the Soviet Union and then was smuggled out of the country in order to be published. Pasternak’s winning the Nobel Prize humiliated and enraged the Soviet Union authorities, and they denigrated Pasternak and forced him to refuse to accept the prize. What should have been a proud moment in Soviet literary history became a huge embarrassment. 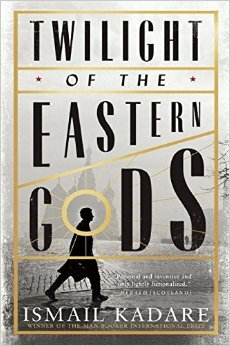 The entire account of the Pasternak campaign is told without any fictional embellishment in ‘Twilight of the Eastern Gods’. Typescripts of ‘Dr. 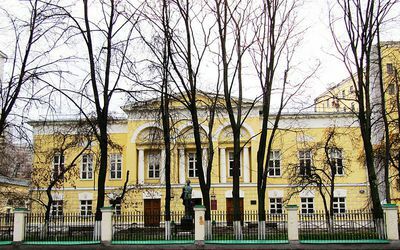 Zhivago’ were passed from writer to writer at the Gorky Institute. Despite Kadare’s scorn of ‘Socialist Realism’ and the Soviet literary world of the 1950s, ‘Twilight of the Eastern Gods’ is also a light-hearted novel of a young man enjoying his time in Moscow. More than one romantic escapade is fondly remembered. *gasp* I haven’t got this one on the TBR – onto the wishlist it goes! I read Kadare’s The Stone of the Stone City when it was shortlisted for the IFFP a year or so ago. It was my first by this author, and even though it may not be his best, I loved it – the writing, the way the story unfolded, the mysterious nature of the narrative. The Pasternak angle in Twilight sounds very interesting, and I’ve made a note. My TBR isn’t quite as big as Lisa’s, but I do need to get it under control! I’ve read about three by Ismail Kadare, and they’ve all been quite good. Another great novelist from that area is Ivo Andric whose ‘The Bridge on the Drina’ is excellent. The case of Boris Pasternak is particularly embarrassing for the Soviets since the Russians have always prided themselves on their literature. I haven’t read Dr. Zhivago yet, but I may just watch the movie. Looking forward to this even more now – needs to come off Mount TBR soon! Another woman with a large TBR!